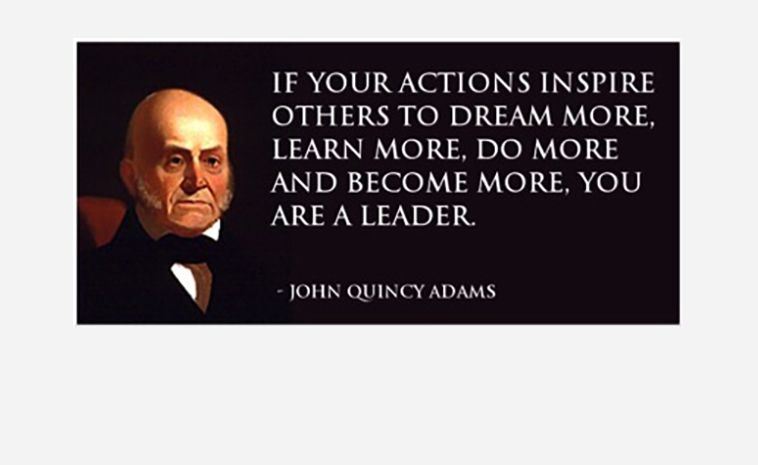 I recently came across this quote by John Quincy Adams, the 6th President of the United States (1825-1829). It reminded me that leadership is not a title, a role or a position; it is simply who you are being for others. When I talk about leadership I ask the audience one simple question: If there is one thing that you need to be a leader, what is it? Although the role of the follower is not often discussed, being a leader means that people choose to follow, not for the leader’s sake, but for themselves. This is because the world the leader describes is attractive to them, and because the example the leader sets shows them it is possible to achieve. People choose to follow leaders that inspire them to be more and accomplish things they would not accomplish on their own. 1) To lead others, first you must learn to lead yourself – leadership comes from your authentic self, from what matters most to you, which is your Why¹. This is the source of all leadership, and knowing this and being able to articulate it is the starting point for being a leader. 2) It’s a choice – leadership is available to everyone. It’s a choice to stand for what you believe and to take action based on that. Whatever your position in an organisation, it’s available to you. 3) It’s about going first – the choice is ours to go first with something, that we see others might not. This could be something seemingly small, yet might have a huge difference on others. 4) It’s about vision – leaders create compelling visions of the future, that describe what it could look like in this new world. Leaders communicate this vision in a way that enrols people, that touches, moves, and inspires them to join with them to bring this into reality. 5) Leadership is about serving others – leadership is never self-serving. Yes, it comes from your Why, but it is focused on providing something to improve the lives of others. 6) It’s not a title, role, or level – some of the best leaders I have known have had little hierarchical status inside their organisation, but nonetheless have been able to make a huge difference. There is much talk about leadership, but one way to learn the most about it is to really look for when it is present. A simple test to find out if it’s present is to ask: Are people choosing to follow because they believe in the same things the leader does? If the answer is yes, we know that the first stage of leadership has begun. And remember: you don’t get to decide if you’re a leader. Others do, and they choose for themselves to follow what you already believe. ¹ Why, your cause, purpose or belief, as first described by Simon Sinek in one of the most watched TED Talks. I just want to tell you that I am newbie to blogging and site-building and definitely loved your web page. Most likely I’m going to bookmark your blog . You surely have impressive stories. Many thanks for revealing your web-site. you are in point of fact a excellent webmaster. The site loading velocity is incredible. It sort of feels that you’re doing any unique trick. Moreover, The contents are masterpiece. you have performed a wonderful job on this topic! you are in point of fact a good webmaster. The web site loading speed is amazing. It seems that you’re doing any unique trick. Also, The contents are masterwork. you have performed a excellent process on this topic! I do believe all of the concepts you’ve presented to your post. They’re really convincing and can definitely work. Still, the posts are too short for starters. Could you please extend them a little from subsequent time? Thanks for the post.